It’s our celebrated line of innovative cabinets with organization solutions that shelves clutter and places kitchen organization front and center. Right where it should be. Diamond’s award-winning cabinet organization system puts organized living within reach, transforming your home from a state of confusion into a well-run operation. A uniquely planned space where there’s a place for everything and everything is in its place. Diamond has received several prestigious awards for our innovative cabinets, giving you more reasons to trust the brand that pioneered the cabinet organization category. 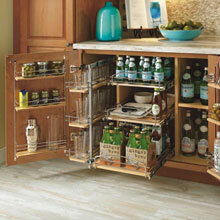 For example, Diamond introduced the SuperCabinet™ to the world of cabinet interiors with rave reviews over 10 years ago. Now the flagship of organization is once again charting new ground with the SuperCabinet V.2 and the Gourmet SuperCabinet. 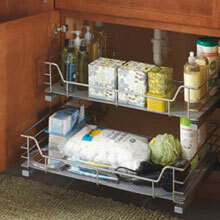 Just another example of how Diamond is continually thinking – and rethinking – about your storage needs. Diamond’s organization gene doesn’t stop in the kitchen. Any one of our award-winning designs can be used in an entry area, laundry room, den or office to coral clutter throughout the home. Diamond also features numerous innovative ideas for the bathroom, such as our U-shaped vanity pullout. The organizational strength of a cabinet rests on a variety of important qualities.